While I may hold the magazine in my hand I can find nothing about it anywhere on the interweb. The Google fails me. 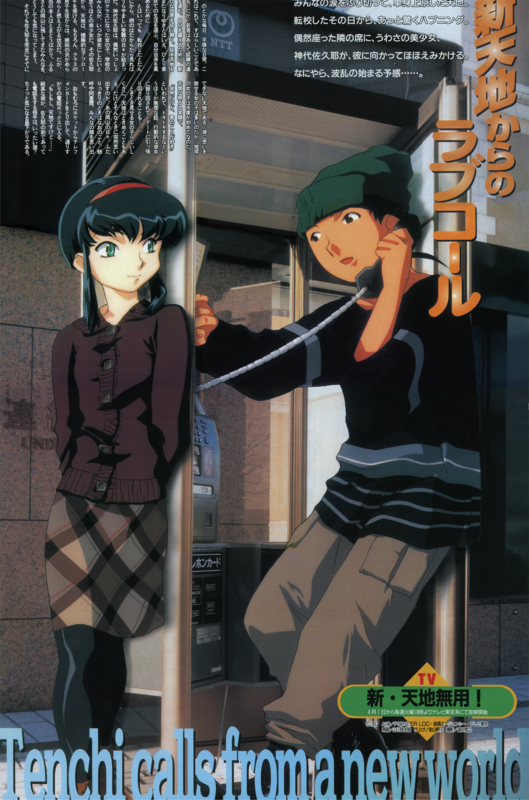 It appears, however, to be an issue of "Megu", subtitled "Hyperkid's Network Magazine", specifically the May 1997 issue. No volume number is present that I can see. Regardless of all that, it does have a single worthy image within it. A two-page spread, featuring a new image (to this one) of Tenchi and Sakuya. As it was over two pages I had to piece it together and, as is wont to happen, the coloration of each page was slightly different. I healed them together and used Photoshop's auto-adjustment tools (With some manual tweaking) to get the colors close to matching. Sharp-eyed observers may see the difference and for that I apologize but, alas, I can do not more.